This challenge was all about naptime. Because I'm a mommy to 4 kids, a wife to 1, I own a business, I scrap, I work part-time, a home manager, care for a daughter who battles autism, I'm pulled in SEVERAL different directions. Sleep eludes me on many days. So, I rest in knowing that when I do lie down, because I pray that God honors His Word, my rest is complete. 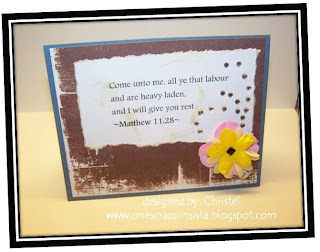 So, I placed this reminder scripture on my card. 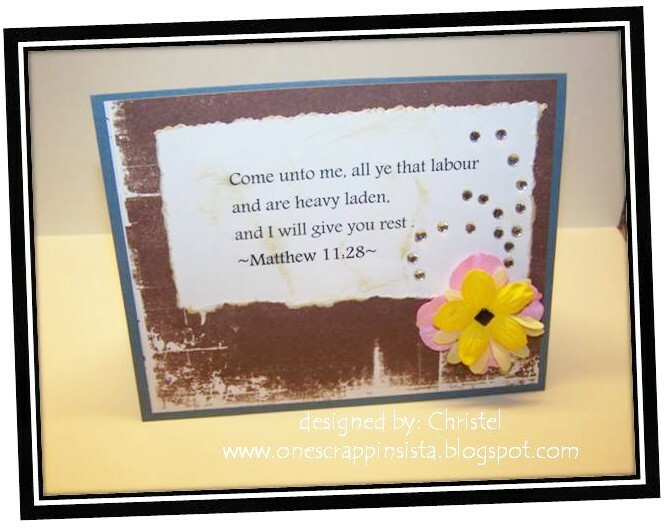 "Come unto me all ye that labour and are heavy laden, and I will give you rest," Matthew 11:28. Now go get some rest people. Enjoy! Awesome thought, beautiful card :-) Thanks for sharing!